In a shocking turn of events, the federal government has voted to maintain the status quo. That is, of course, sarcasm as the feds have an amazing track record of kicking the can. The “irresponsible” Bush tax cuts have been extended based on a deal cut by the Obama administration with the Congressional Republicans. In addition, unemployment benefits have been extended yet again. Take, for example, Rep. John Shadegg (R-AZ) a couple weeks ago on MSNBC’s Morning Joe. Shadegg makes two incredulous claims all-too-typical from partisan Republicans. Of course Republicans don’t want to tax the job creators, because that will bring revenue down… Ah, your answer is that spending money drives the economy, and I don’t think that’s right. It’s the creation of jobs that drives the economy. The truth is, that the unemployed will spend as little of that money as they possibly can… Do we want… to continue to ignore the issue of jobs and increase taxes?In the quote above, Shadegg attempts to make the case that, first, spending doesn’t “drive the economy”. Well, unfortunately, that is incorrect. As much as supply-side economists wish to think otherwise, an economy requires spending. If no one is purchasing goods or services, then there are no jobs. Spending (i.e. demand) necessitates the availability and provision of goods and services – which, in turn, requires jobs.Without debating the merits of government-provided unemployment benefits, you cannot dispute that those checks drive spending. While that spending may not “create” jobs, it most certainly helps maintain the status quo and, at least, “saves” jobs. The second key fallacy in Shadegg’s nonsense is his suggestion that raising taxes means less revenue for the government. This assertion is an implicit reference to the Laffer curve, a concept in tax policy. The curve, named after economist Arthur Laffer, suggests that there is a tax rate somewhere between 0% and 100% which maximizes tax revenues. I could get into a lot of math and show some graphs to discuss this, but, on the surface it should be obvious. With a 0% tax rate, there is clearly no tax revenue. It is also suggested, but not empirically proven, that a 100% tax rate yields no revenue since the economy would go completely underground if no income was retained. This makes sense. Obviously there must be an optimal rate somewhere in between. 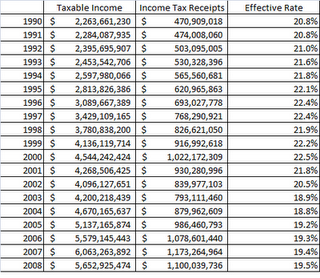 The table above shows a history of net taxable income by year and total net income tax receipts. The effective rate is the simple percentage calculated between the two. This reflects the net effective tax rate in the U.S. after we account for all the deductions, credits, marginal rates, etc. 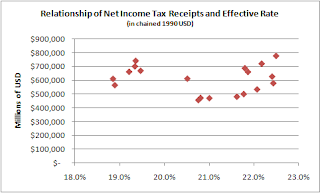 In the graph immediately above, we look at the relationship between these effective rates and total receipts (now expressed in millions of dollars and adjusted for inflation). There is no clear pattern which suggests that it is impossible to conclude anything of substance from the so-called Laffer curve based on today’s tax policy and macroeconomic conditions. I must make one very important point: this does not qualify as my endorsement for higher tax rates. I personally would have voted against the deal to extend the tax cuts in the absence of massive spending cuts. Today’s taxpayers are responsible for electing the officials we have setting the budget today. It is irresponsible to create a larger deficit, increase the national debt, and put our currency at risk for the next generation. It’s time that our representatives take a stand to remove our structural deficit issues.